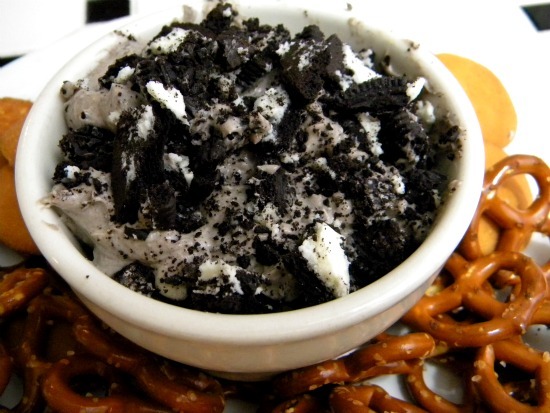 If you like cookies and cream ice cream or cheesecake you’ll probably love this dip. It has all of that cookies and cream flavor with the tang of cream cheese. Chopped white chocolate is folded in for extra flavor. Delicious! This is a sweet dip but if you like a sweet/salty combo consider using pretzel rods, pretzels, potato chips, or Ritz crackers as dippers. Lorna Doones, ‘Nilla Wafers, graham crackers, and chocolate butter cookies are good dippers to use for a major sweet tooth. You can also use strawberries with this. The cookies and cream dip will turn sort of a light brown color if you over stir it. The chocolate cookies sort of disintegrate into the cream cheese mixture. Fold the cookie pieces in quickly when you are finished making the dip – that should help it stay lighter… if it matters to you. It goes together fast and easy for Superbowl or any other party. This dip would be great at bridal showers! A sweet, rich dip that is full of cookies and cream flavor. Perfect for bridal showers, baby showers, or any other party. Beat the cream cheese, salt, and sugar until well blended and no longer grainy. Beat in the sour cream and vanilla and whip. Check the texture. If it is too stiff (it will stiffen when chilled) beat in a tablespoon or two of heavy cream. 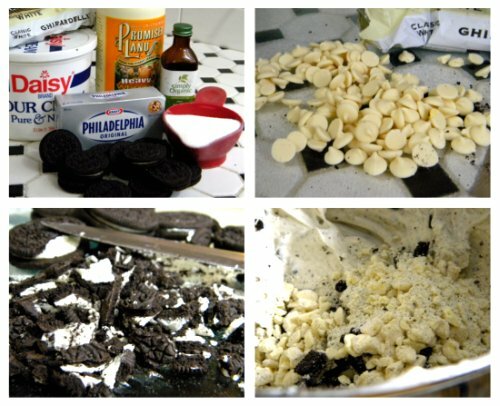 Fold in the chopped white chocolate and oreos. Chill, tightly covered, for at least 2 hours.